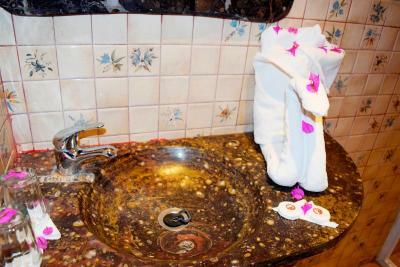 The staff was very friendly and the facility was well maintained and clean. The look and feel of the place is very nice and suits the environment. A nice swimming pool and good friendly service. 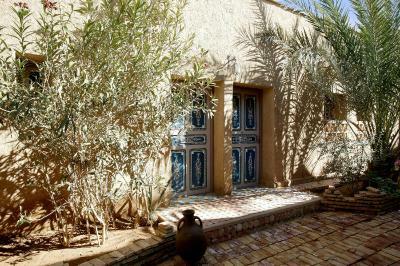 We booked the Riad double room. The place itself is very atmospheric and nicely decorated.Our room was big and spacious, has a minifridge and a lounge area with sofas around a table. The matraze and bedding is comfortable. 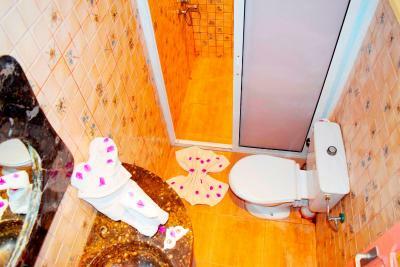 The bathroom is spacious and there are plenty of towels. There is plenty of space to put and hang things. Very huge and clean room and a big nice surprise was the little private smoking room (room no 225). Good bar service and big private parking area. Lovely courtyard and pool area with service for snacks and drinks. The stuff speaks good English, French and some Germain what makes it very easily. I loved the atmosphere and decor and truly felt like I was in a fantasy --- at night it was beyond magical. 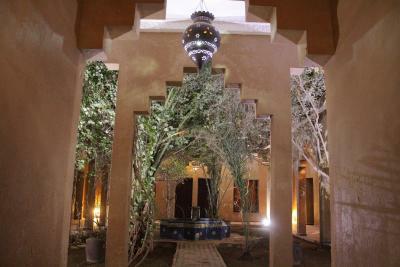 The orientation of the pool, the bar, the restaurant and relaxing areas made each location within the kasbah quite a destination. Our room on the top floor overlooked the pool and was clean and well-appointed and interestingly furnished with the old and new. Slept exceptionally well in the great bed. 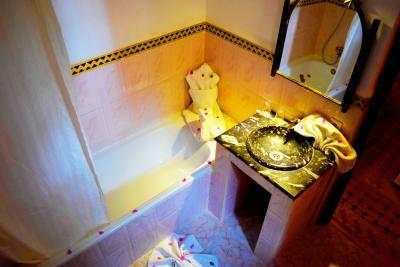 The bathroom was a curiosity with fittings crafted from local fossilized marble. The food in the restaurant, simple and well-presented. The peace at the swiming pool area. The staff was very nice, specially Ismael at the front desk. Our room was very big and nice. Hotel is clean and tidy. Good wi-fi connection. They were able to organizace trip to the desert. 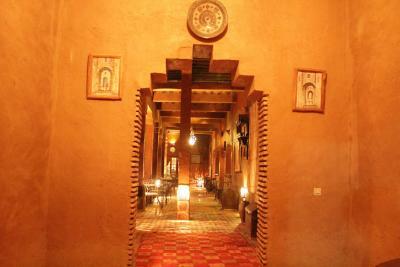 One of our top picks in Erfoud.The Kasbah Tizimi offers comfortable, air-conditioned and authentic accommodations. 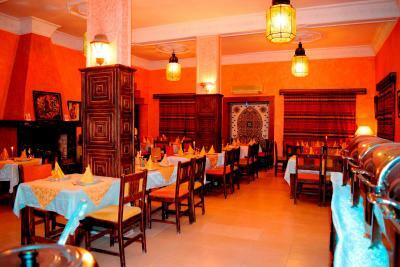 It is near the main road that links the north and south of Morocco and a 1-hour drive from Errachidia. 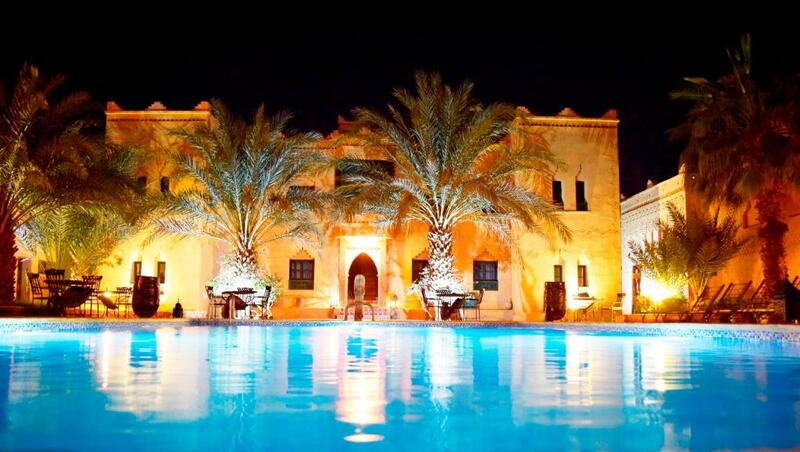 The Kasbah Tizimi is next to the biggest palm grove in Morocco. 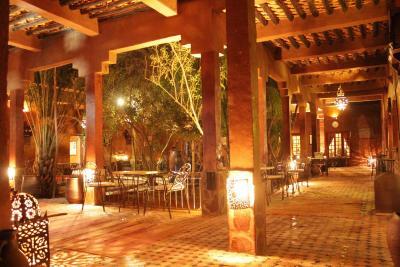 Its numerous outdoor terraces and comfortable lounges offer many places to relax. 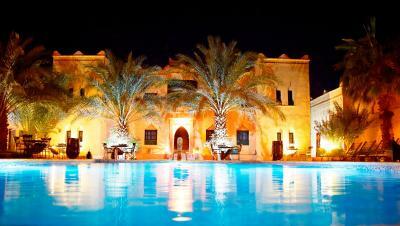 Guest rooms at the Kasbah Tizimi are grouped around the swimming pool. 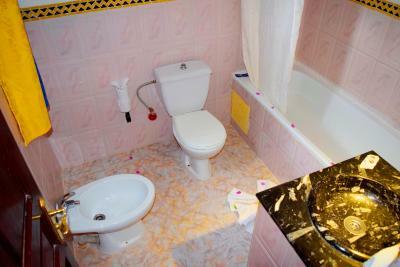 They include private bathrooms, a TV and telephone. 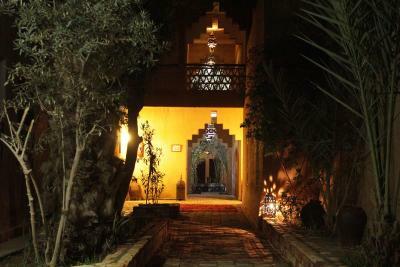 The Kasbah Tizimi is family friendly and offers games and facilities for children. 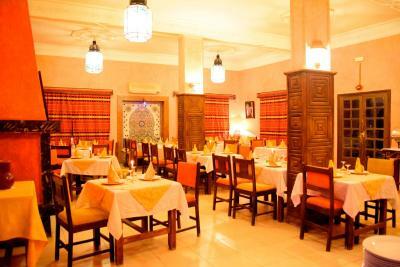 The on-site restaurant serves traditional Moroccan cuisine. This can be enjoyed on the patio or near the fireplace in the cozy dining room. There is also a tea room and a bar. 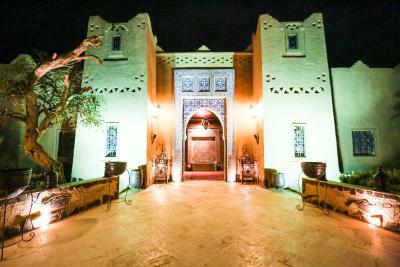 When would you like to stay at Kasbah Tizimi? 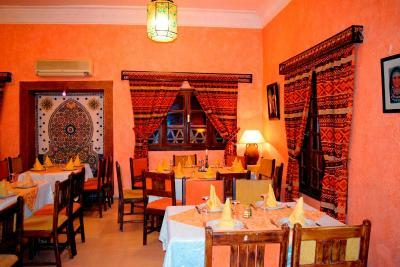 House Rules Kasbah Tizimi takes special requests – add in the next step! 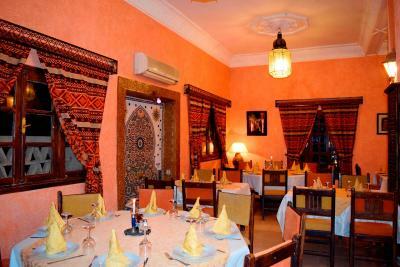 Kasbah Tizimi accepts these cards and reserves the right to temporarily hold an amount prior to arrival. 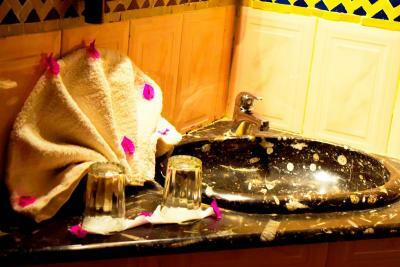 While our room was spotless, being close to the desert means everything has a fine layer of sand which was noticeable all over the place, also the deterioration of fixtures and fittings was also noticeable. The kasbah's location on a road heading out of town means it is isolated so there is nothing within walking distance beyond the kasbah. Menu options were limited. The dinner was not nice, the vegetarian meal was basically dry pasta and the desert was a orange. Dinner at the hotel restaurant was disappointing when it comes to the food. The food was tasteless and dry. For example the pasta had no taste (lack of salt) with almost no sauce. The Mexican salad was dry and tasteless. Even the Moroccan Tajine was lacking taste. The breakfast is a similar story. Bad value for money. Really disappointing, this hotel deserves a better kitchen. Breakfast was ok, but it could be better, with small details (bread was not the best we found). We expected a little better restaurant. It was not possible to pay by credit card (they said they have a bad connection) There was no hair dryer and shampoo in the room. For a place in this price range I would have expected a little bit more. The shower at the pool didn't work, and wifi in the room was spotty. The holder for the shower in the bathroom was broken, and the lighting in the room was not good. As there were no bedsite lamps it was too dark for reading. Breakfast was disappointing.